I wanted to share with you a recipe I’ve been making for years. Matt and I cooked a lot of Thai food in the first few years we were married. Matt had a version of this dish while living in Nashville at a place that served Chinese food, but had Thai posters all over their walls. So Matt asked one day if they would make him some Thai food and the guy excitedly made a chopped chicken dish with Thai basil and hot Thai chilies. Matt was hooked. We love the flavors of fish sauce, soy sauce, the heat of peppers and the sweetness of basil that this dish brings. It’s a wonderful mix of sweet/sour/spicy. Over the years, we’ve lost the original recipe we first referenced and so this is legitimately a Palmer original. Again – don’t be afraid of fish sauce. It’s completely essential to the flavor balance of this dish. If you can’t find Thai basil, regular Italian basil works just fine. I’ve used ground pork, chicken and turkey, as well as hand chopped chicken thighs (so good), but my go-to is ground turkey. Don’t leave off the fried egg! This recipe goes quicker if you use a large wok over really high heat. If you don’t have a wok, use the largest stainless steal skillet, or cast iron skillet you have. Heat the oil over medium high heat till it shimmers. Add in the onion and stir a few times till they soften. Working quickly, stir in the garlic and cook until fragrant, about 30 seconds. Add in your ground meat and jalapenos and stir until meat is cooked through. If you want more heat, stir in your chilies closer to the end of cooking. When the meat has cooked through, toss in the fish and soy sauce and stir to coat. Remove the pan from heat, stir in the chopped basil and cover to keep warm. In a non-stick skillet, fry a couple eggs in peanut oil, and a splash of soy sauce and serve on top. I typically serve this over about a half cup of rice. I’m not going to tell you how to cook rice. 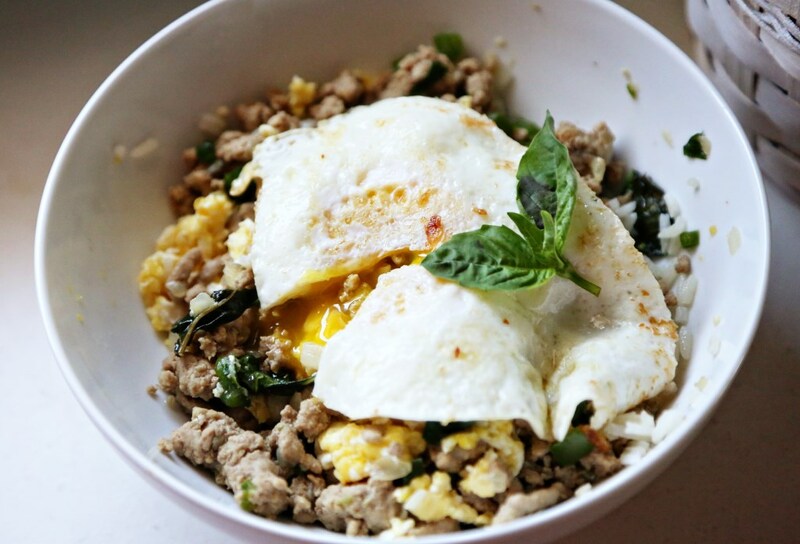 This entry was posted in Eggs are Awesome, Monday Meals and tagged asian, basil, chicken, fish sauce, pork, thai basil, thai food, turkey. Bookmark the permalink.